President Wine and wine Culture Co.,Ltd. Hello. 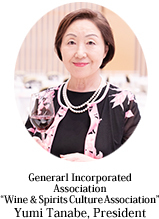 My name is Yumi Tanabe, chairperson of Japan Women’s Wine Awards. I am delighted to inform you that following on the success of our 3rd competition, “Japan Women’s Wine Awards” is gaining recognition as an international wine competition of note -- we are getting ready for our 4th year. Thanks to the warm support from importers and producers during our 3rd competition, we had 3,543 entries from 35 countries, which was 1.8 times as many entries as in the first year. The wines from new countries which participated in the competition for the first time revitalized the market in Japan. The distinguished trend is that Japanese wines were appreciated better than before and the 8 Japanese wines won the Double Gold. Also reflecting current interest in matching between wine and food, the wines awarded “The Best Wines for Asian Foods (including for Sushi, Tempura, Sukiyaki, Yakitori, Korean, Chinese and Thai) were promoted actively in the market. Ms. Karen Turner, a gifted enologist from Languedoc in France was selected as the third-year winner of “The Best Woman Winemaker” and we hope more wines produced by female winemakers will entry for the next competition. Our awards announcement on St. Valentine’s Day prompted department stores, supermarkets and wine shops across Japan to host special fairs featuring the winning wines. Many online shops and catalogue vendors added the wines to their offerings. As a result, we received a great deal of good news about sales increases among the winning wines, and the market response was strong. We would like to thank all the sales outlets for their interest and support, and at the same time, let them know that they need to make regular space on their shelves as well as on the menu of restaurants for more award-winning wines to come! We have been working hard to increase the recognition of Japan Women’s Wine Awards domestically as well as internationally. We took part in FOODEX JAPAN 2016 and showcased all the award-winning wines and staged the Awards ceremony honoring our winners. Internationally, we took part in ProWein 2016 in Germany to meet wine producers and representatives from producers’ associations and organized “Sushi & Wine Matching Event”. Also we visited “Vinitaly 2016” “Vinexpo Hong Kong 2016” for increasing the publicity of our competition. Back in Japan, as the finale of the 3rd competition, we organized the Gala Wine Party where 500 wine lovers enjoyed tasting the awarded wines with a high evaluation. Japan Women’s Wine Awards has three goals: first, contribute to stimulating the wine market in Japan to reach a per person annual wine consumption of 5 liters; second, make known good wines that are compatible with homemade Japanese meals; and, third, increase opportunities for women to work in the wine industry. Join us as we move forward with the 4th Japan Women’s Wine Awards 2017 – I am deeply grateful for the generous cooperation and support from everyone involved in the wine industry -- and from consumers.